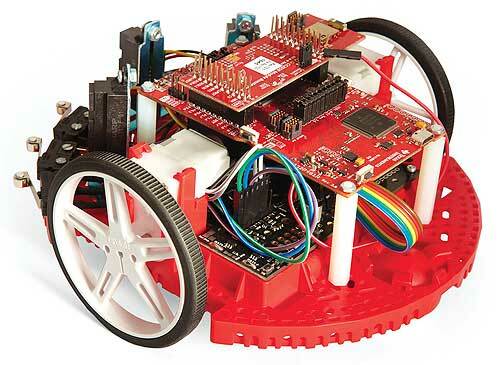 The TI-RSLK is a low-cost robotics kit and classroom curriculum, which provide students a deeper understanding of how electronic system designs work. The first in the series, the Maze Edition, has more than 60 electronic and mechanical components, including the industry-leading SimpleLink™ MSP432P401R microcontroller (MCU) LaunchPad™ Development Kit. TI’s SimpleLink MCU platform is the broadest portfolio of connected ARM® MCUs in a single software development environment, delivering flexible hardware, software and tool options for Internet of Things (IoT) and robotics applications. Designed to supplement university faculty curriculum, the TI-RSLK Maze Edition comes with 20 learning modules covering basic to advanced topics. Each module is complete with lecture videos and slides, lab documentation and demonstration videos, quizzes and classroom activities. The kit and curriculum is fully customizable, allowing faculty to choose how they integrate the TI-RSLK into their class. The TI-RSLK is targeted to teach embedded systems and applications, and can be expanded and used in a variety of engineering classes at any level along a college student’s learning journey.